There has long been an Inn on this site but little is known pre 1960. Dundridge used to have a much larger population, many farm workers cottages were knocked down in the early 20thC due to mechanisation reducing the amount of labour employed on farms, with their plots returning to farm land. Dundridge Lane was a (toll free) route to London and there was a coaching Inn (C.1700, possibly called The Three Elms) for the purpose of changing horses before / after the The South Downs. In December 1896 the premises by then known as The Dundridge Hotel caught fire with the ruins then being blown down in a storm. The following year, the current building opened as The Jubilee (1897 being Victoria’s Diamond Jubilee year). With the changes that were occurring (Bishops Waltham branch line opened in 1863, Meon Valley line 1903) the new public house was very much there to serve the local farming community. It was a small affair with only half of what is now the public bar being given over to the public with a spit ‘n’ sawdust public bar and Jug ‘n’ bottle take away (hence the two bars in one room. The rest of the main building was residential with what is now the lounge bar being stabling. In the 1960s Tommy and Winnie Weston ran the pub and small holding with orchards out the back and pigs and chickens on site. In those days the Pub had a pet pig which Tommy used to take with him in the side car of his motorcycle. Tommy was the last man in England to hold a shilling slaughter license and the pub operated as a small butchers/slaughterhouse. Tommy had the bar tops replaced in C.1964 by Mr. Askew Snr. who confessed that the reason the wood acquired was supposed to be a coffin. In 2017 his son Mark Askew restored the bar tops as they had begun to warp and split. His father had done such a good job of attaching them that he had to be contacted at his current residence in France for advice. Fortunately, even after all these years, he could remember how and where he’d hidden the screws. Tommy had fought in both wars and died as a result of old shrapnel entering an artery in his sleep. By all accounts, He and Winnie weren’t exactly fond of each other by this time. Winnie got up, realised he was dead, put pennies on his eyes and went and fed the chickens. She then opened up the pub and carried on with her day. It wasn’t until the vicar came in for a pint that she told him he was dead upstairs. Although she wanted to keep hold of the pub, Gales forced her out within a couple of years. The 70’s saw the arrival of accomplished archers Stan and Carol Montague who ran Hampshire Archery and brought Merdon Bowmen Archery Club with them from it’s previous home of Merdon Castle. Carol was in the British Olympic Archery team. Tragically she died in childbirth in about 1974. 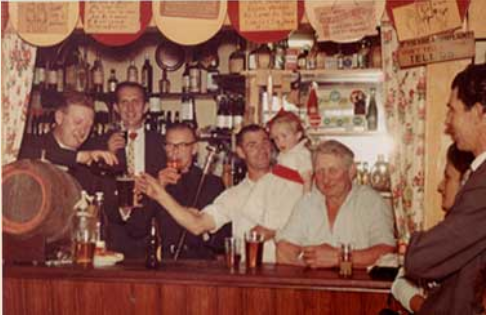 Stan remarried and carried on running the pub until the early 1980s. 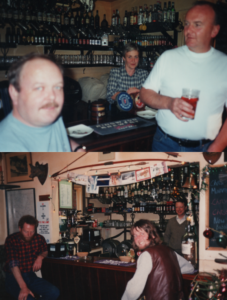 It was during Stan’s time that we became a biker pub, he used to run trail runs out of here, through local woods and tracks. 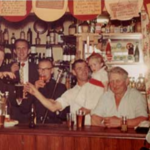 Stan oversaw the enlarging of the public bar into the private front room, creating the space we know today and had the toilet block built which now forms part of the lounge bar. The old orchards were ripped out to open up the garden and create the archery field. The 1980s saw a decline in the pub with a succession of landlords, the only one anyone can actually remember is “Jim the bus driver”. 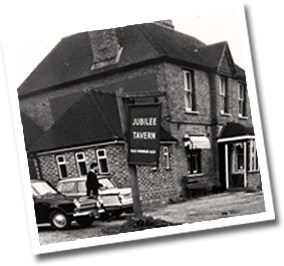 In 1987 Gales put the pub up for sale and it nearly became a private house. Fortunately Charles and Caroline Scott bought the pub and installed their old friend Tim Park from Guildford along with his friend Peter as Tenant Landlord. Tim had a vision of how a pub should be run. He tore up his business plan after only a few days and adjusted to the way things are done round here! Sadly Peter was diagnosed with cancer and died in the early years of their tenancy. In 2002 Tim retired and his former Assistant Manager Heather took over the tenancy. In 2006 Heather and the Scotts converted the old stables and toilet block into the lounge bar that you see today bringing the pub kicking and screaming into the late 20th century. 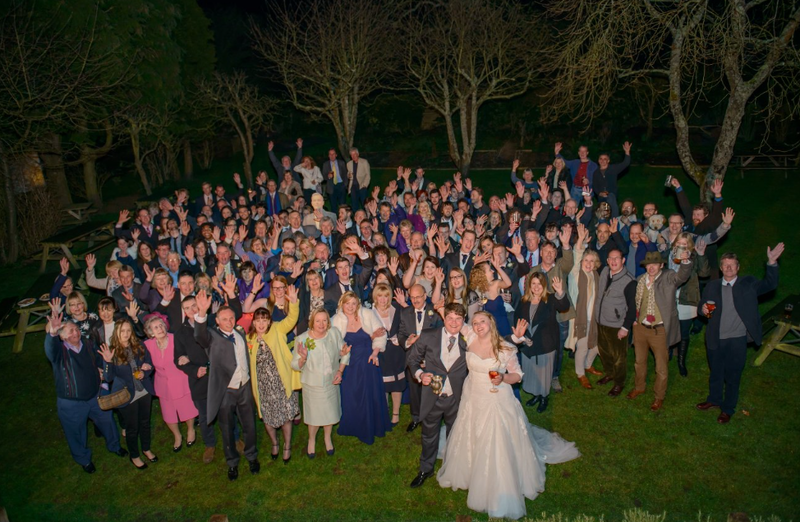 In 2012, Heather retired and her former Assistant Manager Mark (me) and his soon to be wife Chloe took on the pub, going on to get married and have two children in the pub where we had met working together for Heather some years earlier. The building that stands in the car park was a small forge in use until at least 1979. The chandelier on which the optics are mounted behind the bar is one of several pieces of iron work round the property that was made on site.